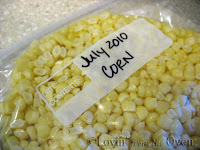 Frieda Loves Bread: Sweet Corn All Year Round: Freeze it! 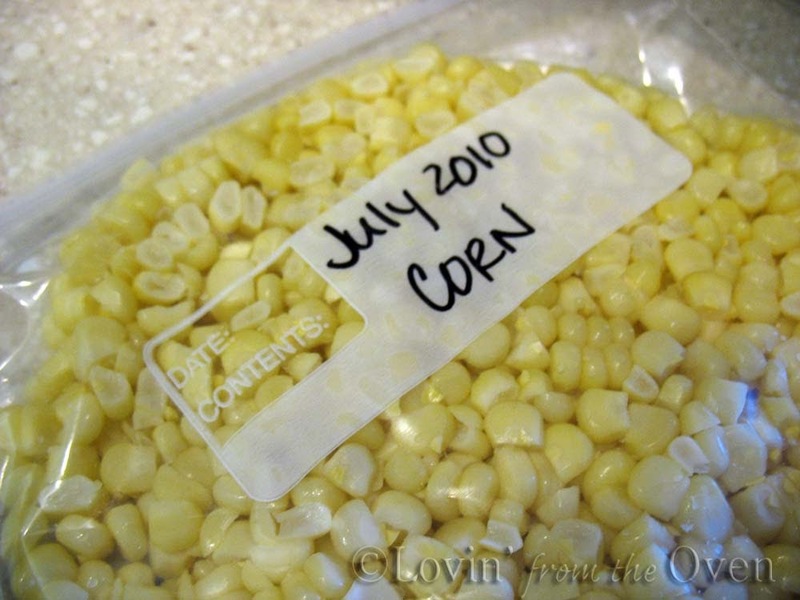 4 Sweet Corn All Year Round: Freeze it! I love the taste of sweet, buttery corn on the cob. 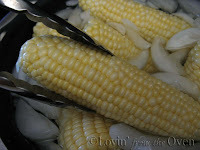 One of our favorite ways to cook corn is in their husks on the grill. Nothing says summer like fresh corn on the cob, and now you can have it all year round! 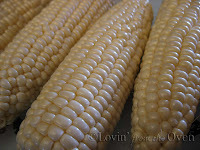 Fresh corn should have bright green husks; the silk should be stiff, dark and moist. You should be able to feel the individual kernels by pressing gently against the husk. As soon as corn is picked, its sugar begins a gradual conversion to starch. I had some corn cobs in my fridge for a week and it tasted bland. This is easily resolved by adding 1 teaspoon of sugar per quart of boiling water and cooking the raw, husked corn for 3 or 4 minutes. So the best day to cook and eat corn is the same day it is picked or purchased. I found a great deal on corn for ten cents per ear. I kept the corn in the fridge overnight. The next day, I debated pressure canning versus freezing. 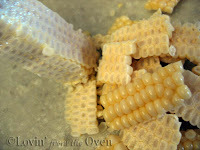 After looking at the instructions, I decided that freezing corn was much, much easier and wouldn't heat up my kitchen! It is easy. The following method uses blanching to deactivate the natural enzymes, resulting in a better quality frozen corn. 1. Cleans off surface dirt and organisms. 3. Reduces enzyme activity that can discolor and cause flavor changes. 4. Removes air and softens the texture for easier packing. Husk and remove the silk from the corn. 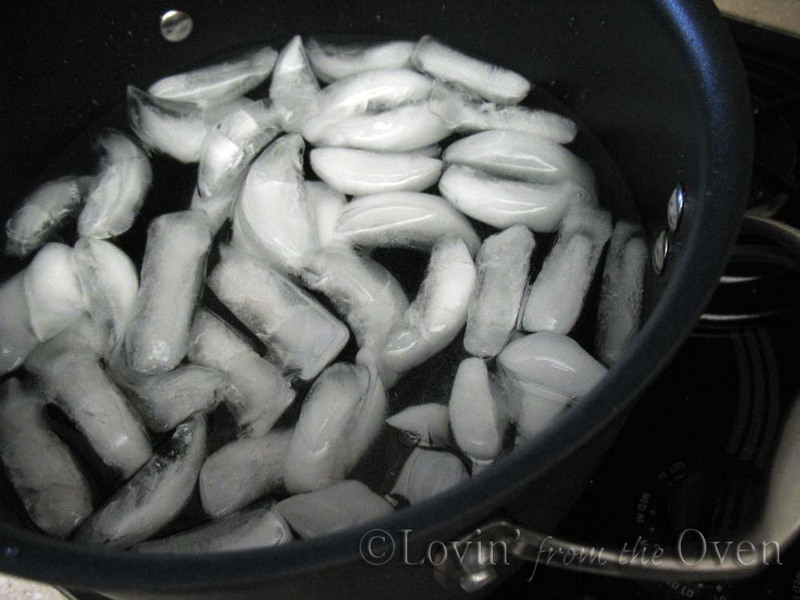 Prepare a large pot of water on the stove and bring it to boiling. 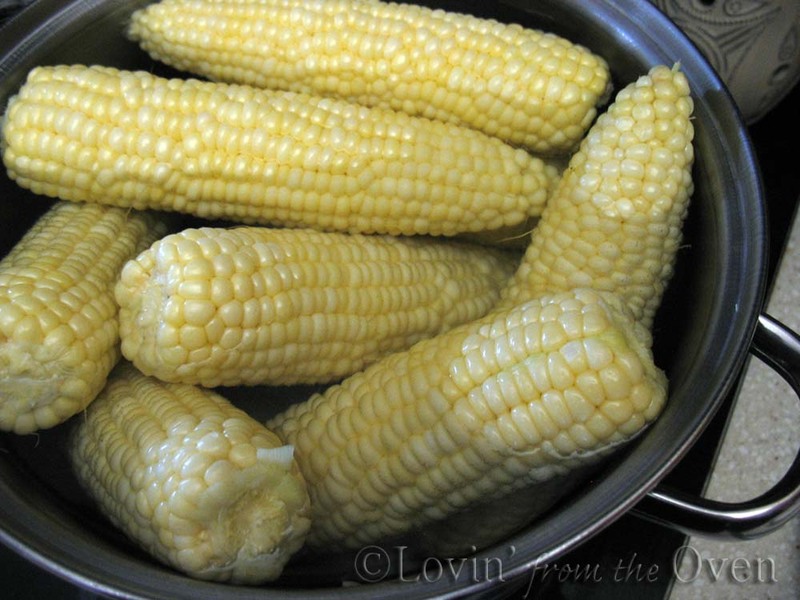 Add your ears of corn to the boiling water. Do not pack the corn in tightly. They should move about freely. The corn will bob and float, and that's okay. Cover the pot. As soon as you put your corn in, set your timer for six minutes. Do not cook any longer ~ it will turn your corn tough and mushy. If your water doesn't return to a boil in one minute, you have too much corn in your pot. 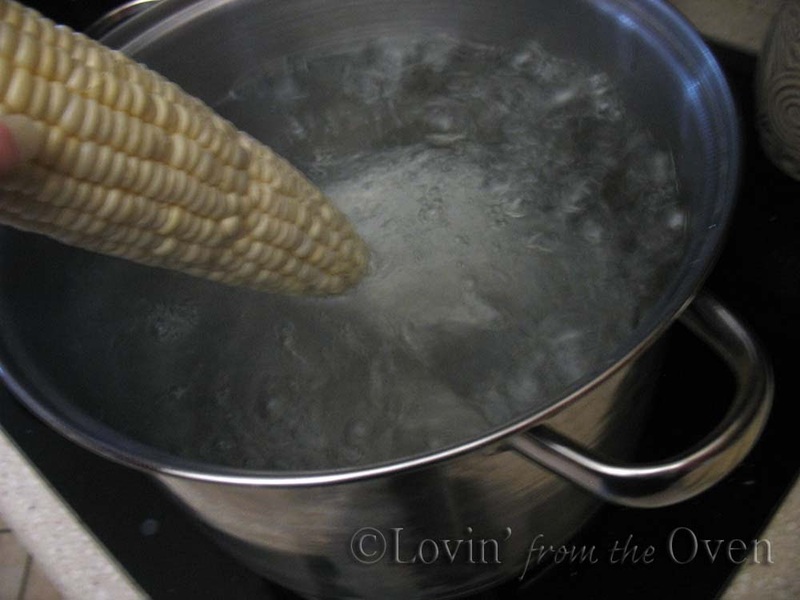 While your corn is blanching, prepare a large pot of ice water. After six minutes, put the ears in the ice water bath. After six minutes, remove the corn and drain. Cut the kernels off with a sharp knife. If you have a LOT of corn, I would recommend purchasing a corn cutter similar to this one. If you use this, I would suggest driving a couple of 2" sturdy nails through a 1/2" thick piece of wood, then place the cob stalk end down on the nails. 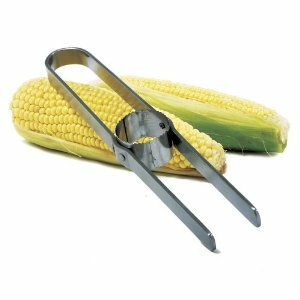 This will support your cob while you use two hands to shave the corn kernels off. A half cup of cut corn is a serving size. 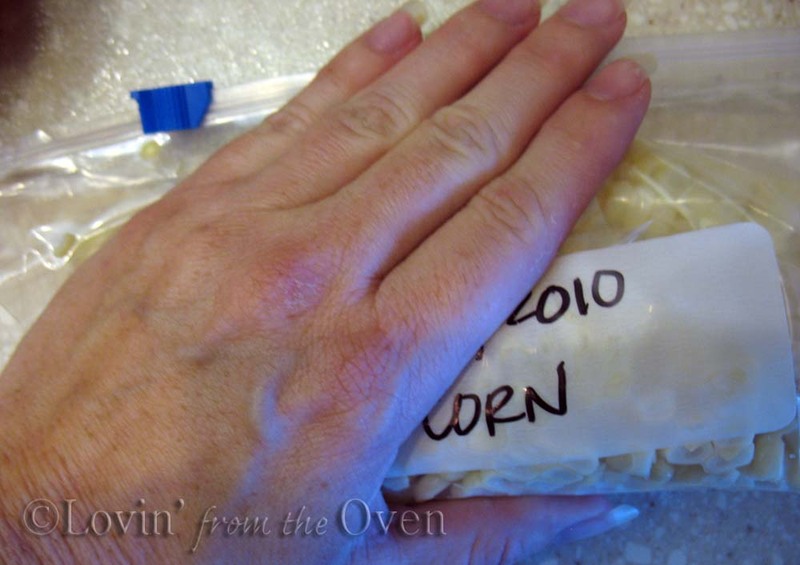 I put the measured corn into a freezer slider top bag. These Sure Seal bags from Fresh Market work well. zip the bag closed all the way and flatten it out. Now my corn is ready for the freezer and ready to enjoy in the middle of winter! Remember to enter my JULY GIVEAWAY for a $60 gift from CSN stores! Ends July 17, 2010. I absolutely love your tips. My dad used to preach about cooking corn the same day it was picked but I never knew why. Now I know that if I don't have time to get to it for a couple of days I can add some sugar and bring it back to life. Keep those garden tips coming Frieda! Thanks, Mags! Our dads are pretty smart, aren't they? 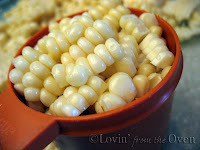 There is nothing like fresh corn, but freezer corn is a wonderful second. I'm so happy to hear that the cutting tool is actually useful. Thanks for the tip- as always you're blog is full of great information. Thanks for the tip on blanching and freezing it. It's really such a short time you can get fresh corn here, outside of corn-country, and I love corn. This will be much much much better than buying canned!